HMH Books for Young Readers, 9780544272200, 32pp. Author-illustrator Tina Kügler lives in the Los Angeles area with her artist husband and three sons. When she is not making picture books, she can be found trying to befriend snails and worms in her backyard. "This quiet, engaging offering celebrates the artist's vision and her idiosyncratic work." "The illustrations combine watercolor with digital painting, collage, and vintage papers, resulting in a soft palette and an uncomplicated, accessible drawing style. Children will delight in the whimsy of the art pieces and their placement in the garden as well as the participation of Mary’s dogs, Sassafras and Basil, in the discovery process." 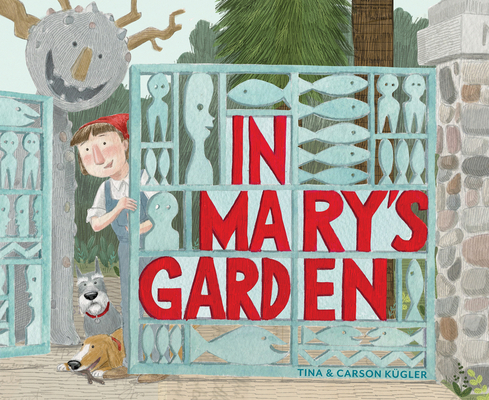 "The Küglers use watercolor, digital painting, collage and vintage papers to portray Mary's world and sculptures...A friendly chronicle of an offbeat artist." "Chalky mixed-media collages are punctuated by items of significance...a quiet homage." "The authors embellish their picture-book biography of artist Mary Nohl (1914–2001) with touches of whimsy...The illustrations—digital collages of scratchy, affectionate paintings on an assortment of papers—mirror this sense of wonder." "An appealing and kid-friendly introduction to Nohl's art."